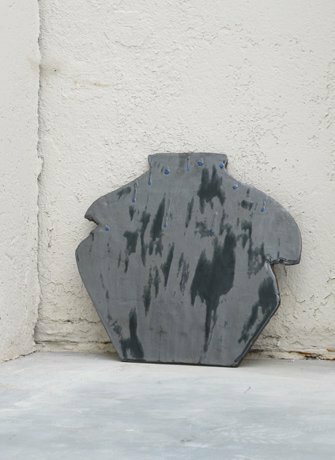 We met Jenny Blumenfield, a Los Angeles born ceramics artist, for the first time half way through her residency at EKWC. The EKWC (European Ceramics Work Centre) is a Dutch ceramics residency centre based in the province Noord-Brabant, which is not just for potters or ceramics artists, but for artists of all disciplines. Resident artists, whether they are experts or unfamiliar with the materials of clay, glazing and firing, are invited to explore and experiment with the assistance of a top notch clay workshop technician. We spoke with Jenny Blumenfield about her experience and the work she had produced at EKWC thus far. She planned her “to do at EKWC” residency well ahead, because the studios and the equipment available made it possible for her to work on a much larger scale than she was used to. At home, her Brooklyn New York studio, measures only 1/6th the size of her EKWC studio. We talked about the photographs she recently took, her sketches and some works which were laying flat to dry. 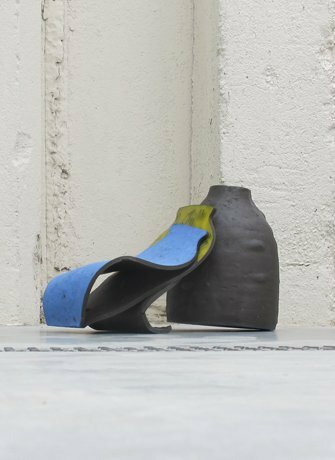 Jenny Blumenfield invited SEA Foundation to come and visit the studio again at the end of her residency in another 6 weeks time, to see how she elaborated further on her theme “Expanded ceramics”. And so we did. Early last Saturday we drove in 15 minutes to the EKWC as the Ceramic lab is very close to Tilburg. Ceramics are one of the most durable objects of material culture, and they reflect the aesthetic tastes of the societies in which they are produced and consumed. From early man’s humble cooking pots to postmodern vessels, women have always had a special relationship with fired clay. Since the earliest times women have made pottery; they have cooked, carried water, stored and served food in pottery. They have used ceramics in domestic rituals and decorative display. Women have also left their mark in the field of ceramics as writers, teachers, business women, gallery owners and collectors. Amongst others, this prime use of pottery was one of the reasons why Jenny Blumenfield, in first instance, wanted to stay clear of pots and vessels in her sculptural ceramic works. But it came out differently in this residency. The woman’s body is symbolically a container and one could certainly argue that this makes a container symbolically a woman’s body in the new Jenny Blumenfield’s works to date. And there is more to it, because this fresh new body of work is also about fascination for mankind, by trying to capture the interior space as a cast, as ‘vessels’ are representations of the female form. Seeming archaeological, they resemble ancient water or oil carrying vessels, even canopic jars. The works do not depict the old style female fertility such as the Venus of Willendorf, or speak of generations of women bearing future generations. These vessels, these female forms for which she uses handbuilt pots, some made from clay rolls or from slabs, do speak of a completely new and agile way of depicting women as carriers. 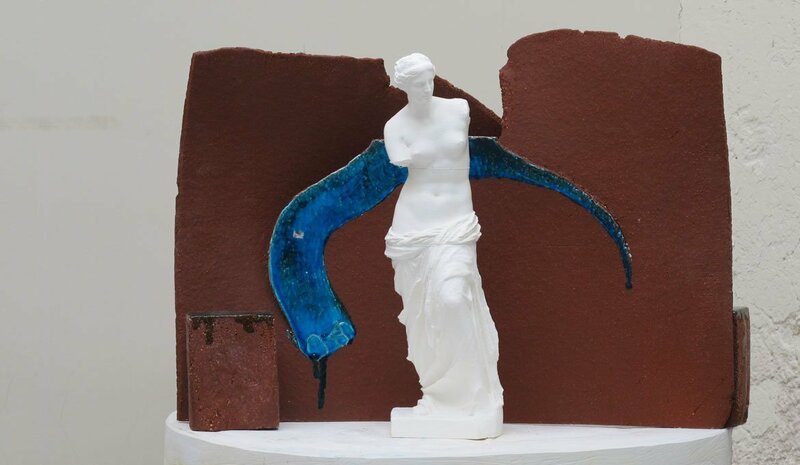 When earlier on Jenny Blumenfield pushed away from the female identities in connection to pottery, during her residency at EKWC she intended to re-embrace and emphasise this subject in her installations in which she used 3D prints of pure white classical, female sculptures. 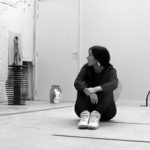 Her new works touch upon basic values of pottery; craftsmanship, knowledge of materials and the use of glazing and the 3D-printing facilities. This is also interesting in the light that she restricted herself in the use of colour. Natural clay, a transparent glaze over and blue and yellow are Jenny Blumenfields’ preferent colours. The red accent, which can be seen in the photographs, is a look-a-like vessel and represents the unreal, as they are unlike the pottery, made from lightweight, vermillion red painted cardboard and thus 2-dimensional. To add to this, and what strikes me in particular is that back to basics suddenly has added more extra layers into the work. Less is more as in juxtaposing the flat and the sculptural, a real woman and a sculptured one, painted or not painted surface. The scope of the female white (unpainted) sculptures and the addition of a coloured human female body evokes surprising outcomes, while the primary colours accentuating the forms and outlines of the vessels. Therefore, although women have been primarily producers and consumers of ceramics and as women have been left out for a large part of the history of ceramics technology, Jenny Blumenfield’s work in connection to self identity and social status then, as now, are forever intertwined with its art and craft. She made that statement clip and clear. This is what makes Jenny Blumenfield’s new works, photographs and sculptures such a feast, as they celebrate the women within. Her works are about challenging and reshaping the identity of ceramics, they celebrate clay and the qualities of femininity. As pottery, traditionally used by women to carry water, fruits, nuts, as well as to cradle babies, Jenny Blumenfield’s works and installations are much more than that. This is where the vessel is transformed and added to, so as to take up the shape of the vessel within, filled as a container with the silhouettes and bodies of vases and women’s life forms, truly a magical experience.